Posted on Monday, January 16th, 2017 in Democratic Republic of Congo, Parks, Travel. 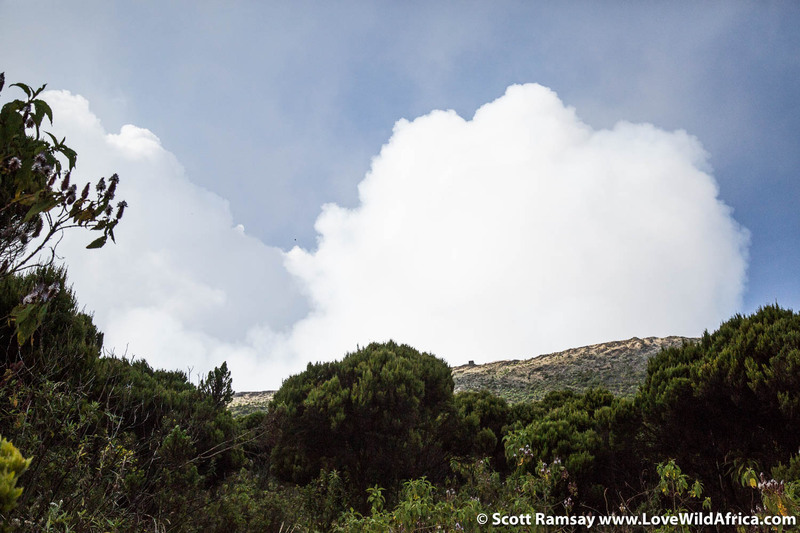 Everyone knows Mount Kilimanjaro, the famous African mountain that is summited by thousands of tourists every year. 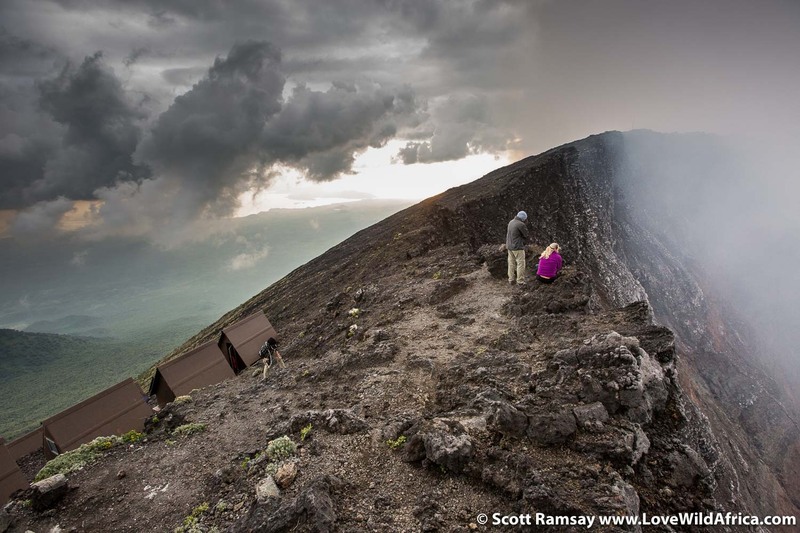 But do you know Mount Nyiragongo? I didn’t. But I recently walked up its steep slopes and slept a night at the top. Now, I’ll never forget it. Nyiragongo is impossible to forget. It is a steep-sided stratovolcano standing 3 470 metres high above the skyline of Lake Kivu. It is one of two active volcanoes in the Virunga Mountains, which lie between Lake Edward and Lake Kivu in the Albertine Rift, the western side of Africa’s great rift valley. 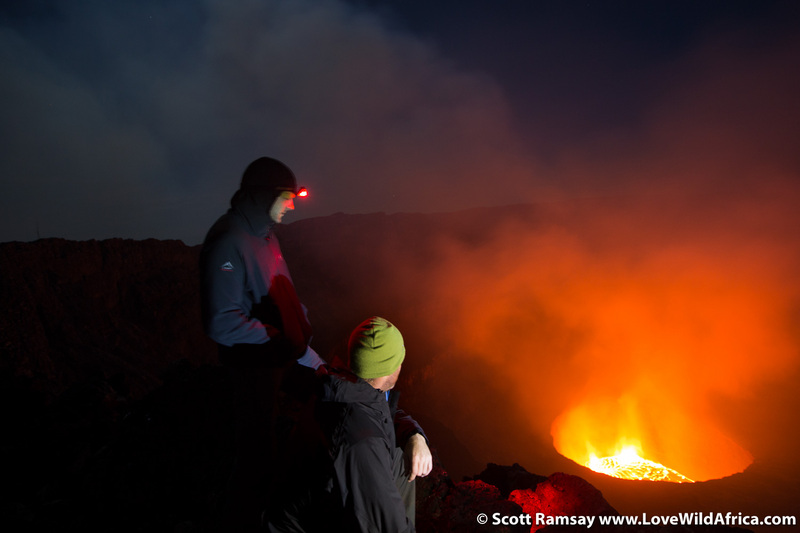 Nyiragongo is two kilometres lower than Kilimanjaro (5 895 metres), and takes just 6 hours to walk up from the starting point of about 1 990 metres. But it’s steep, it’s rocky, and it’s dangerous in a mesmerising way. 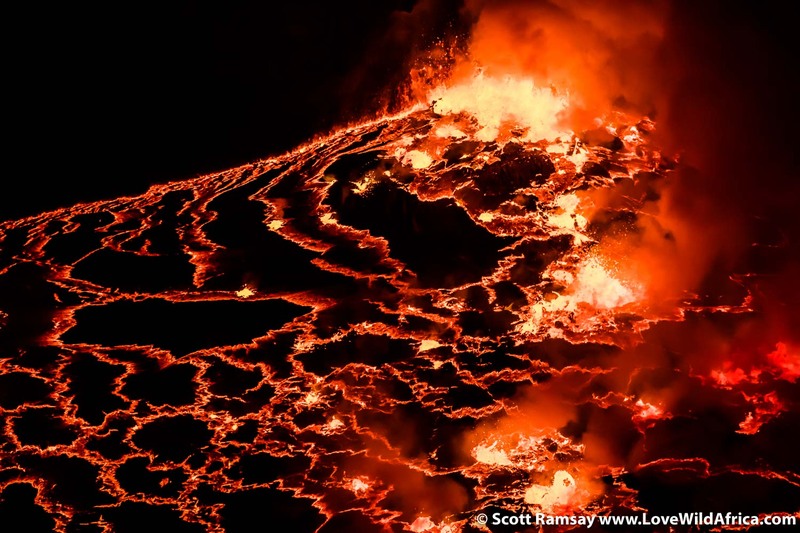 Nyiragongo is one of the few volcanoes in the world that has a persistently fluid and active lava lake, along with Erta Ale (Ethiopia), Ambrym (Vanuatu), Erebus (Antarctica) and Kilauea (Hawaii). 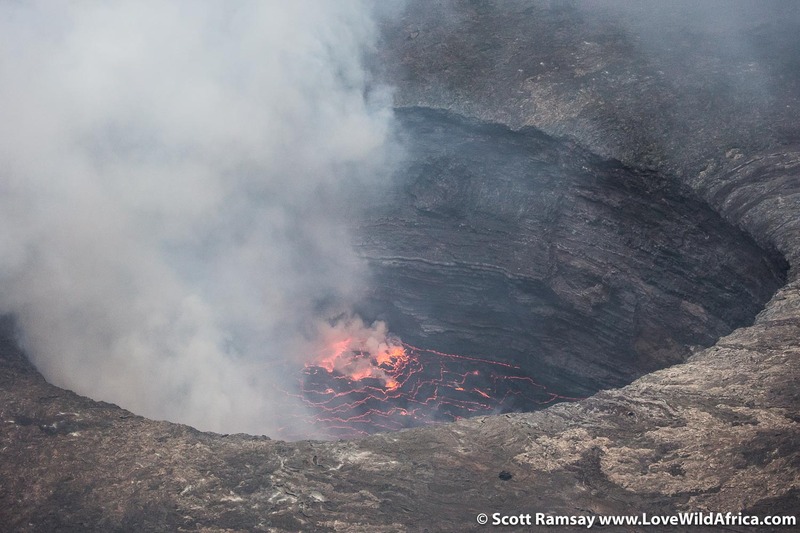 Nyiragongo contains the largest, most voluminous lava lake of all, a broiling, sizzling, steaming, erupting body of molten magma, about 6oo metres wide that lies at the base of the high surrounding crater. Because of the very low amount of silica in Nyiragongo’s basaltic lava, its molten magma is highly fluid. 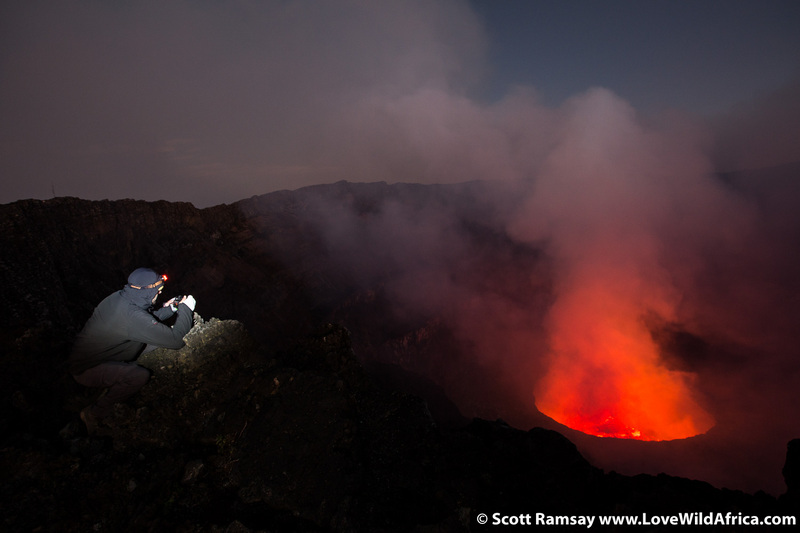 When the volcano erupted in 1977 and again in 2002, the lava flowed down the slopes at up to speeds of 100km/h. This would make Tolkien’s Mordor seem positively welcoming in comparison. 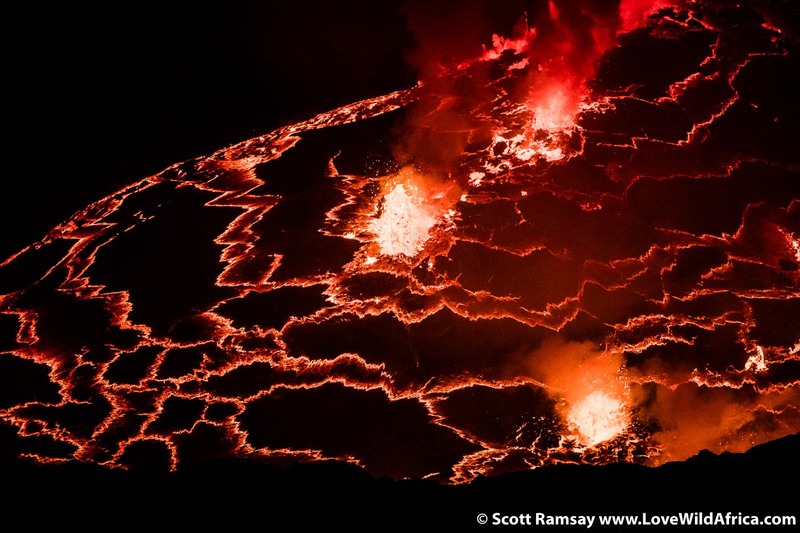 In 2002, half the city of Goma had to be evacuated, as the lava flowed straight through town, killing about 150 people, mostly from carbon dioxide asphyxiation. 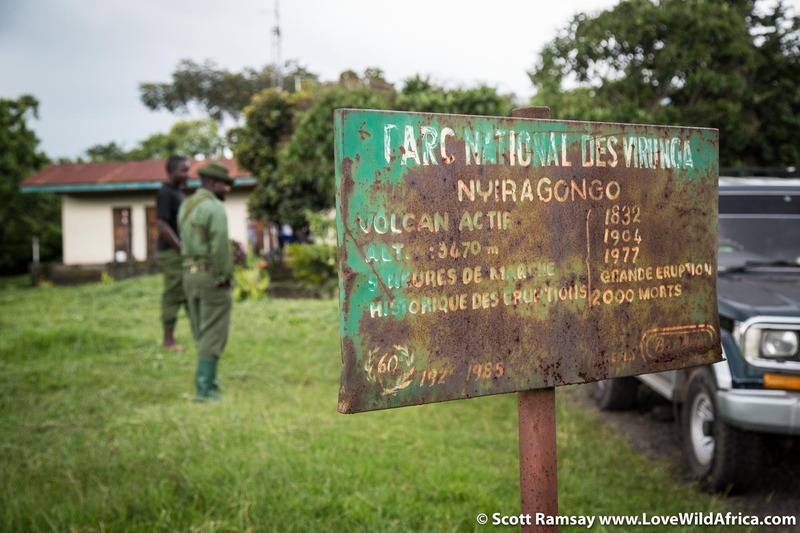 It may seem strange, then, to market Nyiragongo as a must-do tourism destination, but as destructive as it can be, it’s also immensely rewarding (as long as you don’t happen to visit during a sporadic eruption. 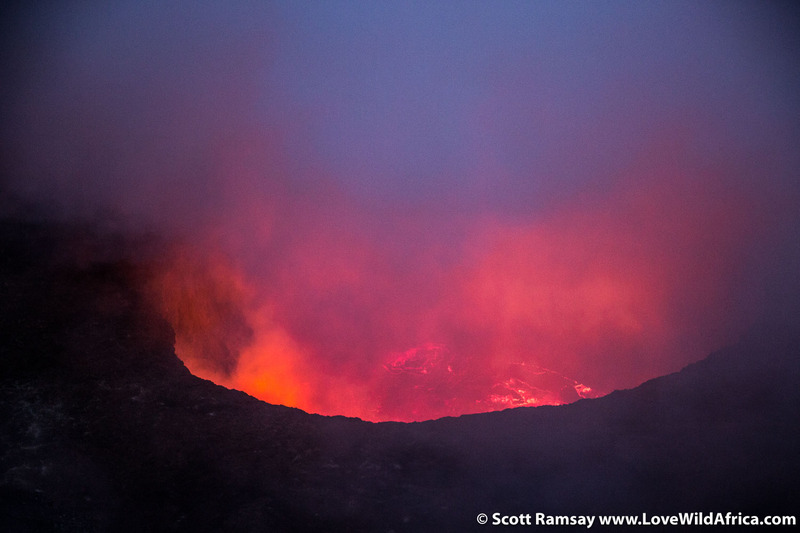 Nyiragongo has erupted at least 34 times since the late 1800s). What makes it so memorable is the visceral assault on your senses at the summit. Like seeing mountain gorillas for the first time, it’s impossible to prepare yourself for the intensity of the summit views and the sight of the lava lake below. It lives and breathes. This is a ringside seat to the creation of the Earth, and for that, the price of US$300 could be considered reasonable. What I found most impressive, however, were the sounds and the smells. The volcano emits a constant, low-decibel roar, as if it’s coming from the centre of the planet. It’s not exactly a comforting sound, I admit. Then there’s the constant farting of gases from the bowels of the Earth. 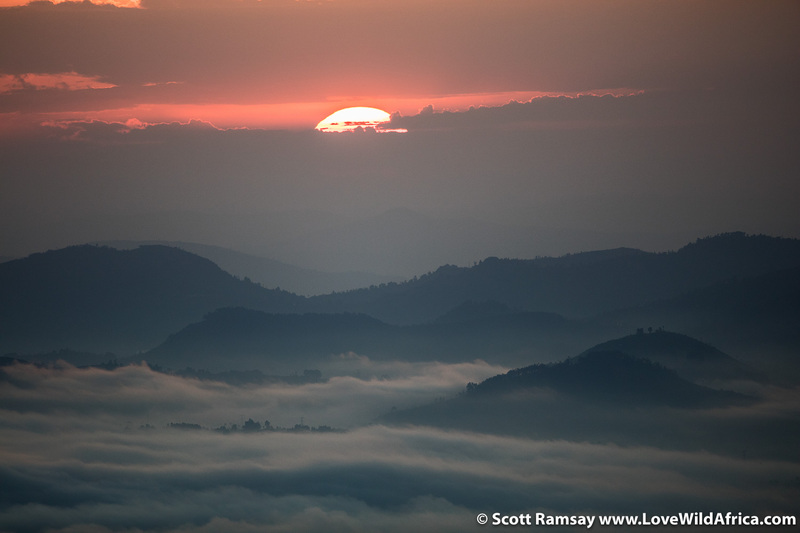 Sulphur and carbon dioxide fill the sky in huge clouds, and although its never overpowering, it’s always there. Before you check out the photos below, here’s a basic one-minute video I filmed with my 500mm Canon F4 lens. It’ll give you an idea of what Nyiragongo is all about. 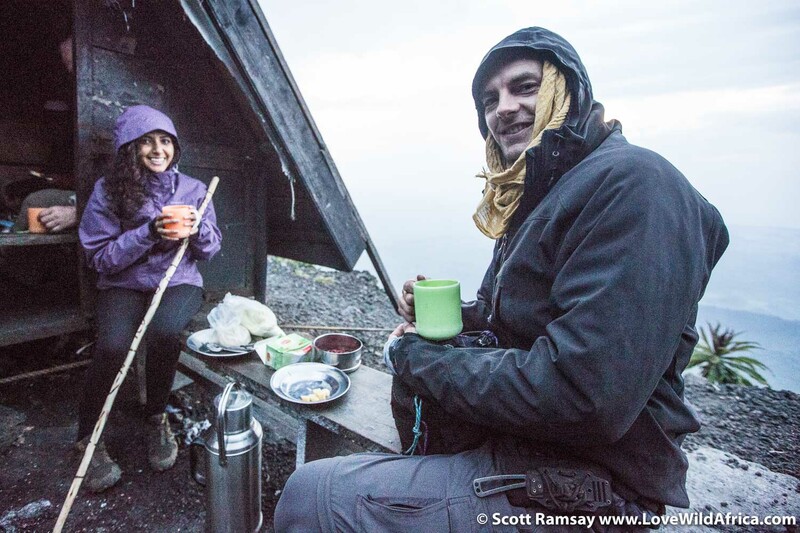 As mentioned, the permit to walk up Nyiragongo and sleep the night at the top in basic huts is US$300, which is actually more expensive than a low-season gorilla permit (US$200). The hike up the mountain takes about 6 hours, with four stops of about 20 minutes each. I found it pretty easy going, but some didn’t. Then again, I had a porter carrying my heavy camera equipment (local porters are available at about US$10 per day). 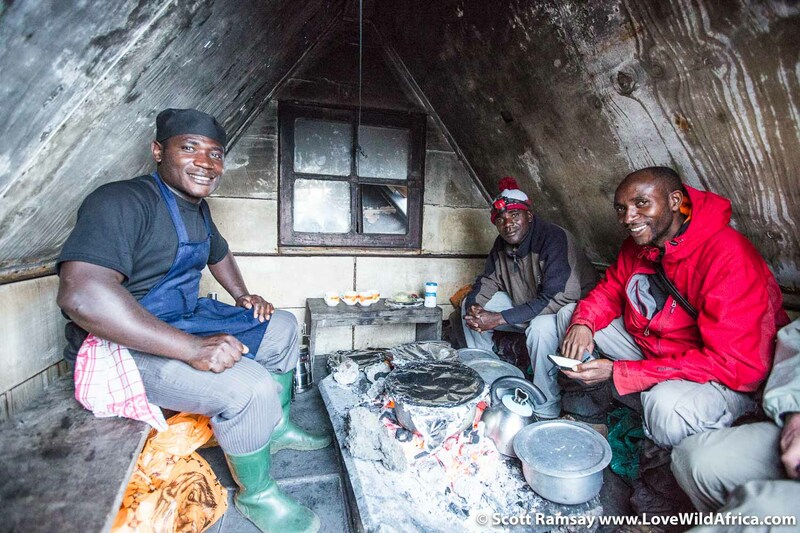 Food, guides and armed rangers are included in the price (when you’re in Virunga, you get used to armed rangers being part of the price of most things). Is it worth the price? Depends. 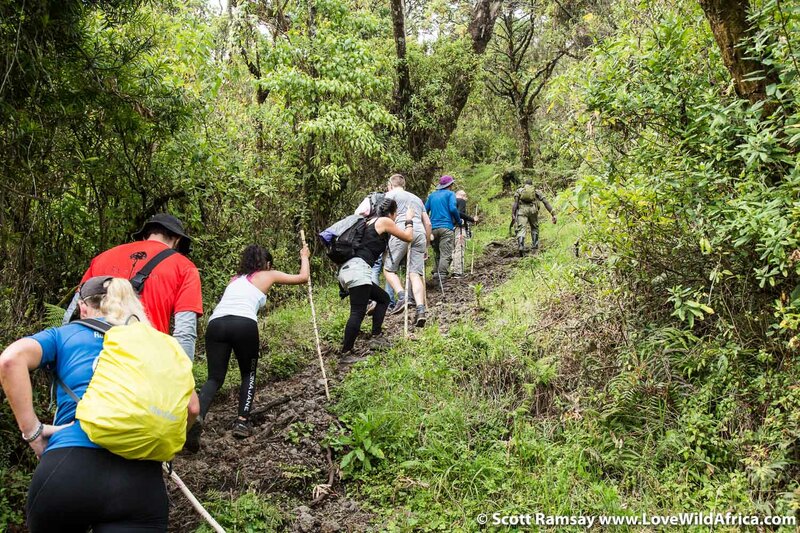 If you’ve done the gorilla trek already, then yes, it’s a great spectacle. But honestly, if I had to go again to Virunga, I’d probably spend the money on additional gorilla trek. For me, gorillas will always be number one. The starting point for the trek up to the top of Nyiragongo is about 14kms north of Goma. 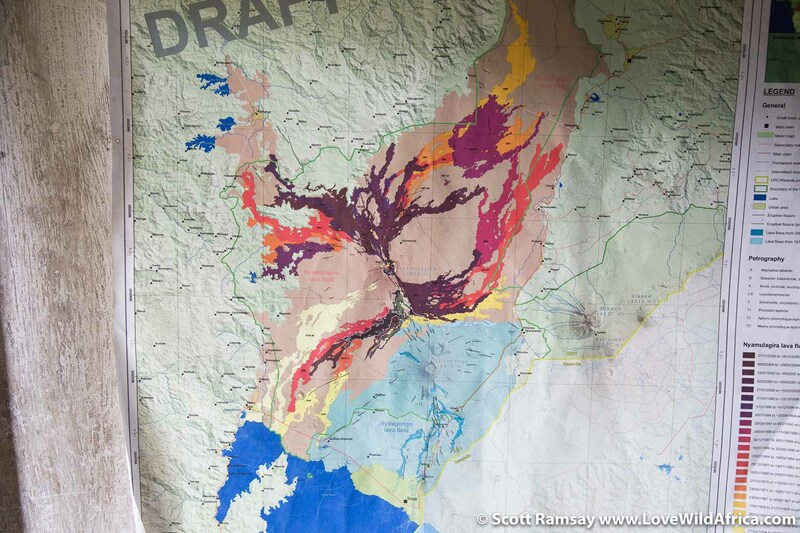 A geological map of the region, predominantly showing the two active volcanoes – Nyiragongo (the light blue) and Nyamulagira (pinkish and purple). 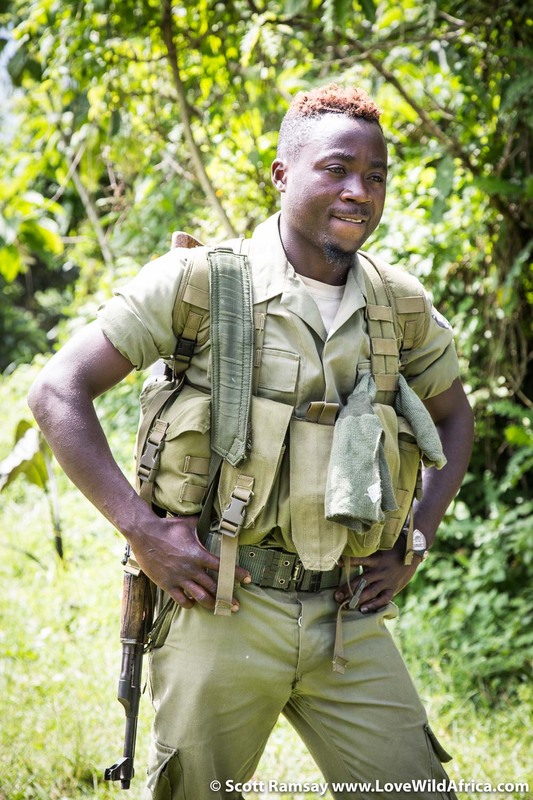 Our armed ranger for the trip – Fabrice Kalushali. As a tourist to Virunga, you don’t go anywhere without an armed ranger alongside you. 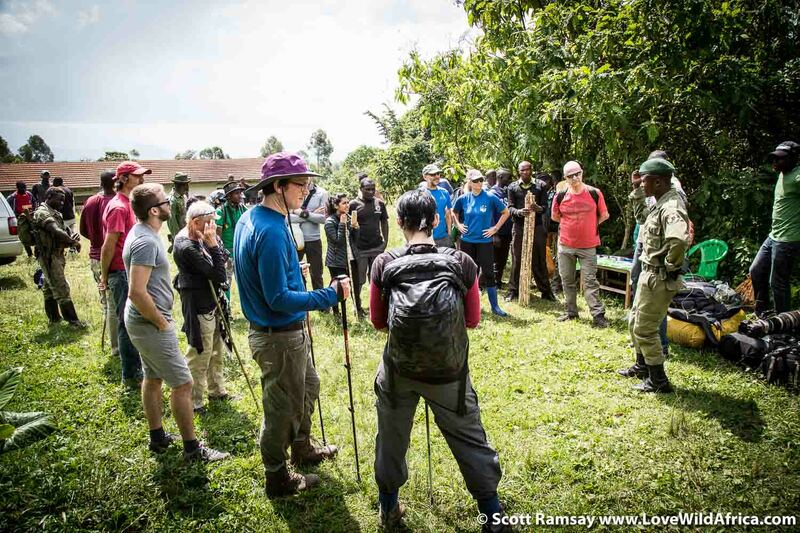 Our group of hikers gets briefed by a ranger on what to expect. 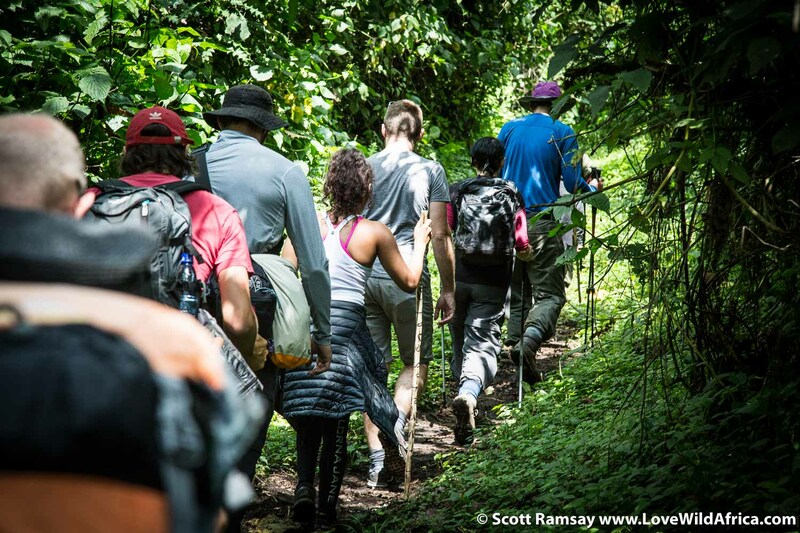 There are porters available to hire to carry your gear, for about US$20 per day. Heading off into the forest. At first, the flat terrain makes for easy walking. Enjoy it while it lasts. 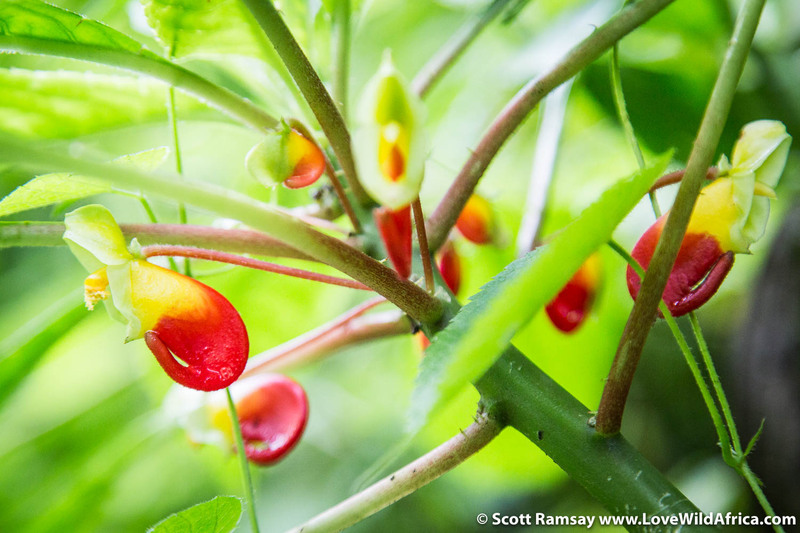 In among all the green are colourful botanical jewels. 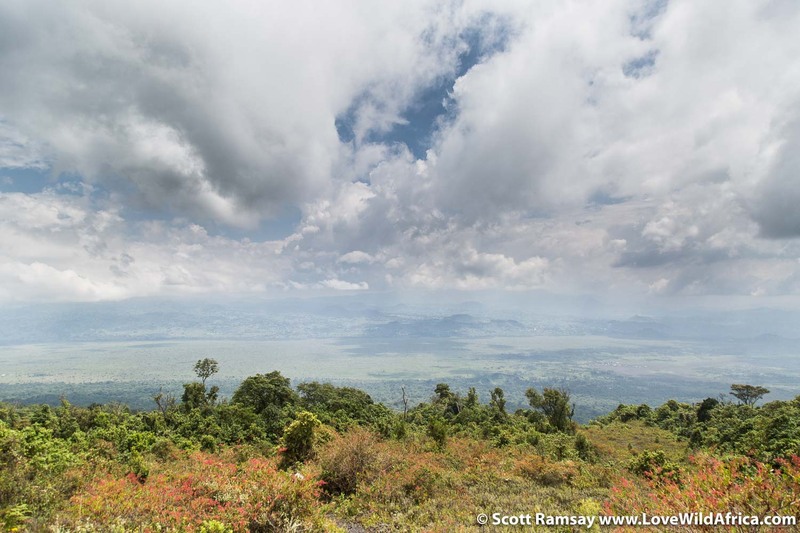 The forest soon clears away, as you gain altitude, to reveal expansive views south towards Rwanda and Goma. 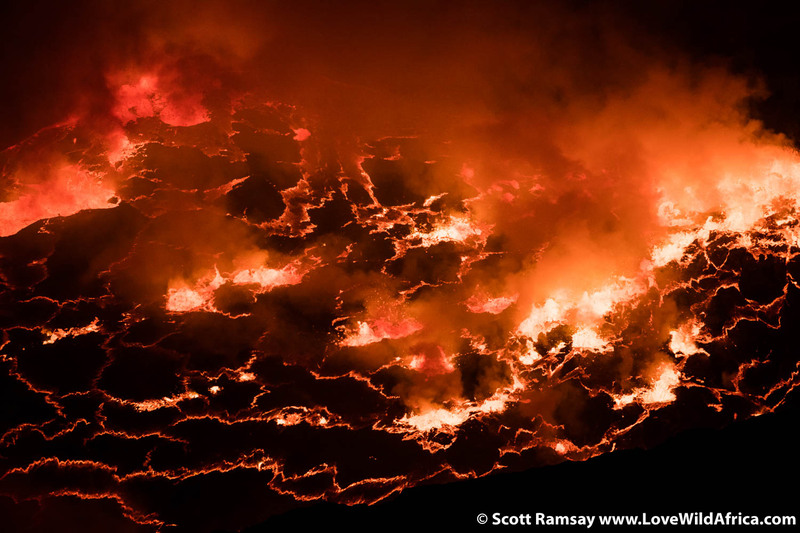 In 2002, Nyiragongo erupted from a side fissure on it’s southern flanks, and the lava flowed at about 60km/h down the hill, reaching Goma 18kms to the south. In this photo you can see the lava path through the forest. 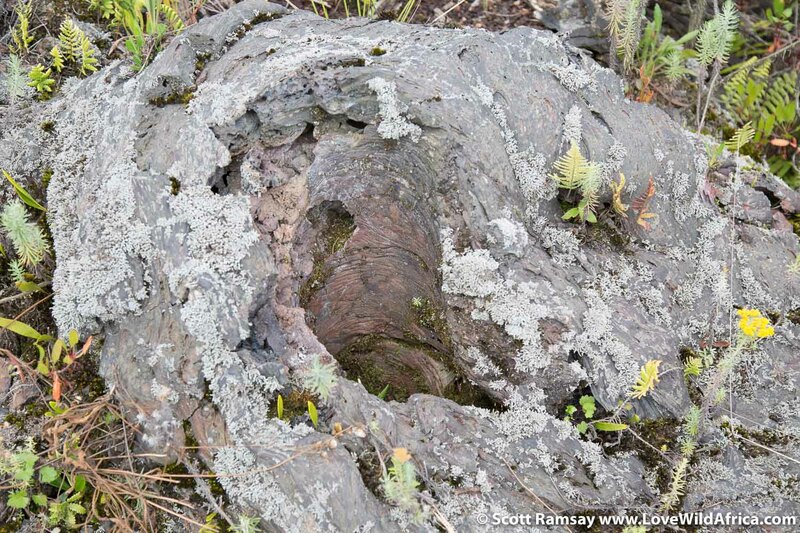 An example of how the lava engulged the trunk of a tree, which subsequently burned away to leave a hole. The hike to the top of Nyiragongo is just 7kms but it takes five to six hours, because you start out at 1 990 metres, and climb 1 500 metres to the top, which is 3 470 metres. 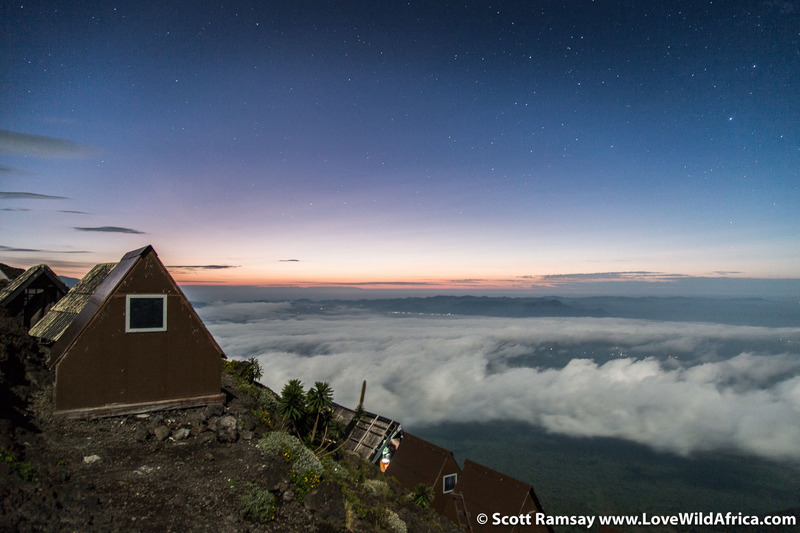 The first views of the huts at the top of the crater become visible. From this point on, you still have another hour to walk. And those plumes of clouds is sulphur gas, mixing and cooling with the atmosphere. We arrived at about 4pm at the top of the crater, and this was the view that greeted us. 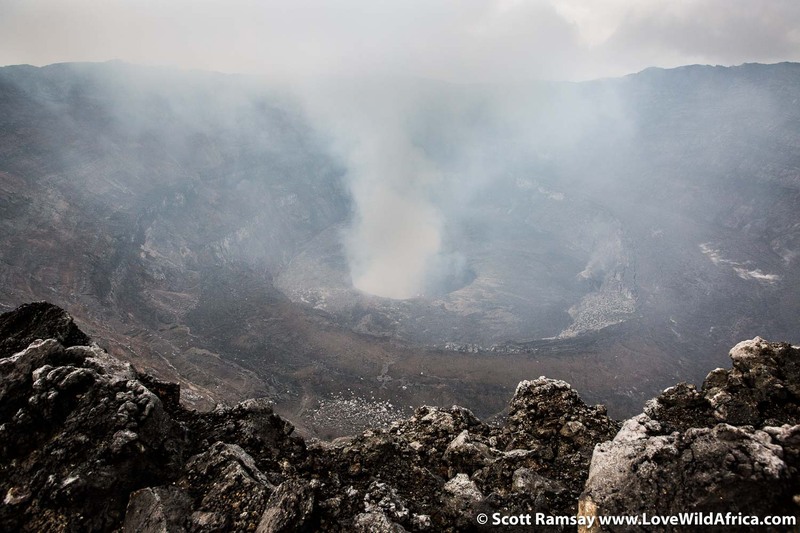 The crater is about 1,2kms wide, and about 700 metres deep. 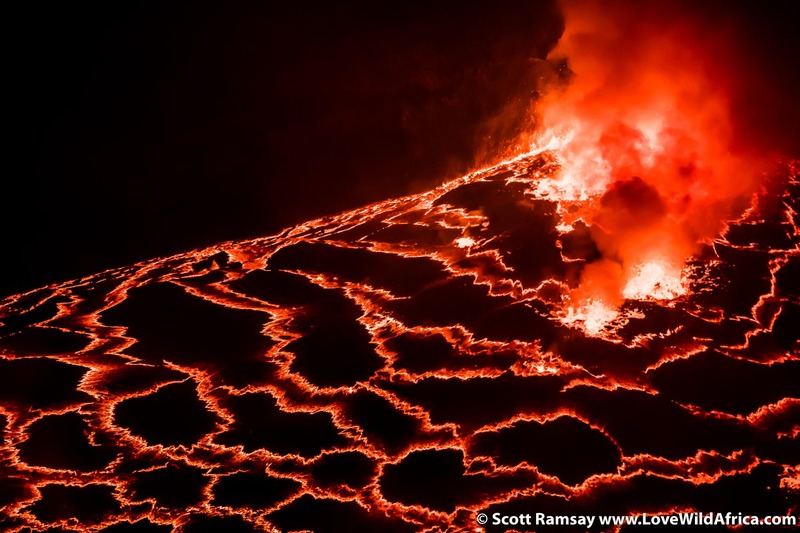 Everything about Nyiragongo is breathtaking and intimidating. This is just a small part of the eastern edge of the middle crater. Note the plume of gas exiting from the mini mountain. It’s very hard to judge the scale of the landscape…a person would be really tiny in this photo. 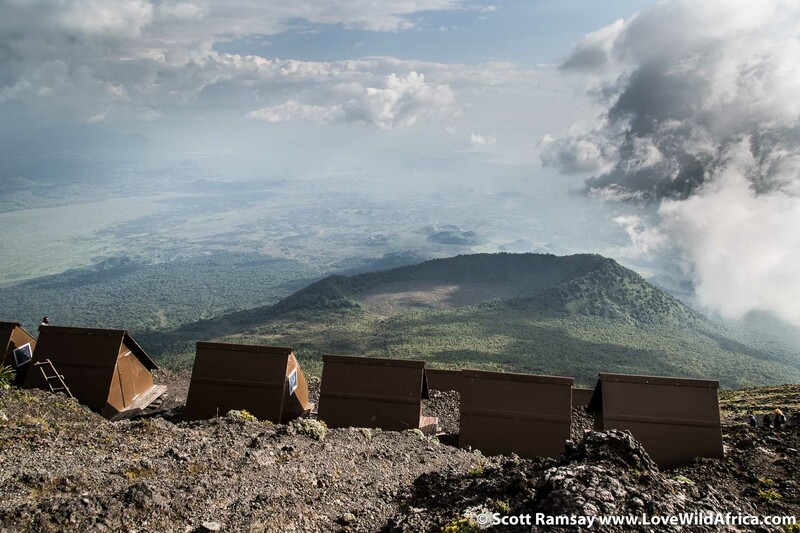 The huts at the summit of Nyiragongo, as seen from the edge of the crater, looking south towards Goma and Lake Kivu. When these huts were built, apparently every single bit of construction material was carried up by rangers and porters! 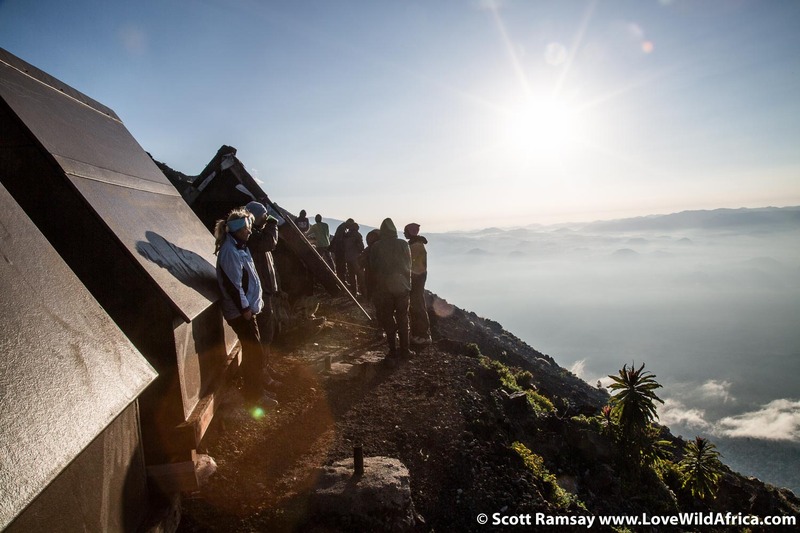 Although the crater is located on the equator, and temperatures at Goma are warm and sultry, there was a very cold wind blowing at the top. Be sure to take warm clothing, and a change of dry clothing after your walk up, when you’re bound to sweat a lot! 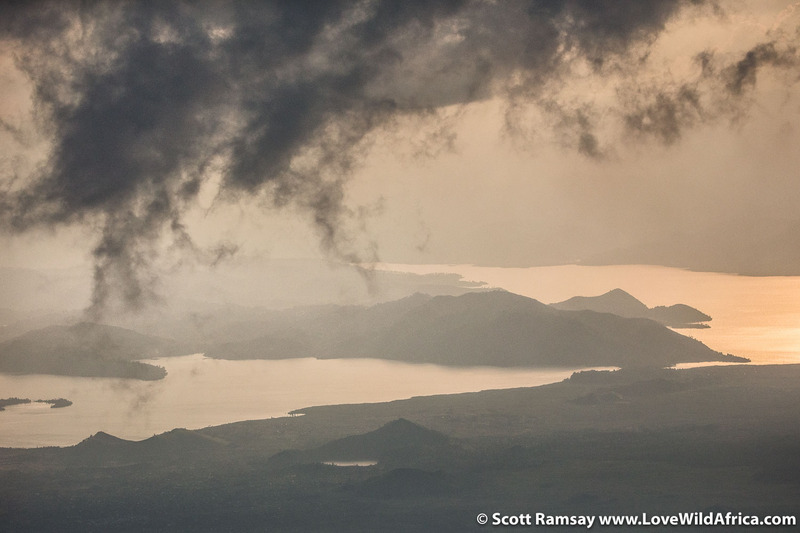 Lake Kivu to the south of Nyiragongo, at sunset. 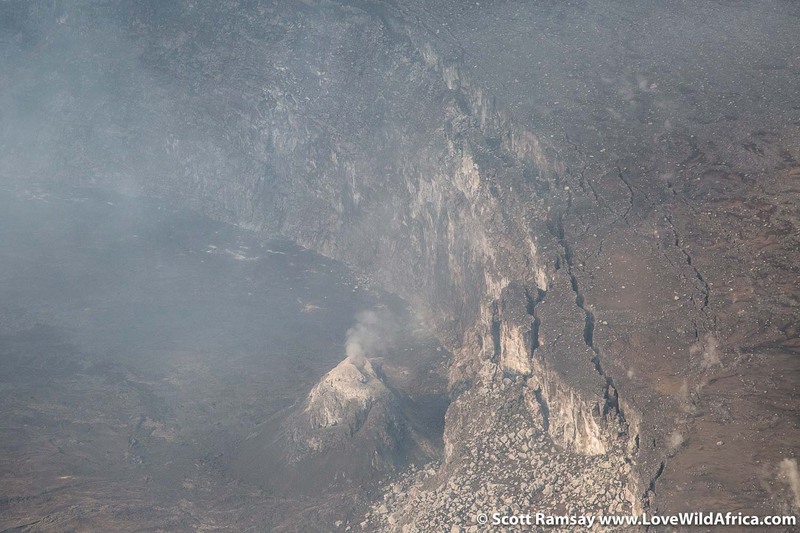 The volcano’s proximity to the lake is a potentially huge threat to the local people. The unstable geology and high concentrations of carbon dioxide and methane could result in the lake “exploding”, literally, causing massive eruptions of both gases, which could asphyxiate anyone living within a few kilometres of the lake. There’s a real chance, too, of the gaseous explosions causing tsunamis. As the sun started going down, the lava’s bright colours started to reveal themselves. My friends Carishma and Gael, enjoying a hot cup of tea with their dinner. There’s a constant low-decibel roar from the erupting lava in the lake below…it never goes away, and it’s not exactly a comforting sound! 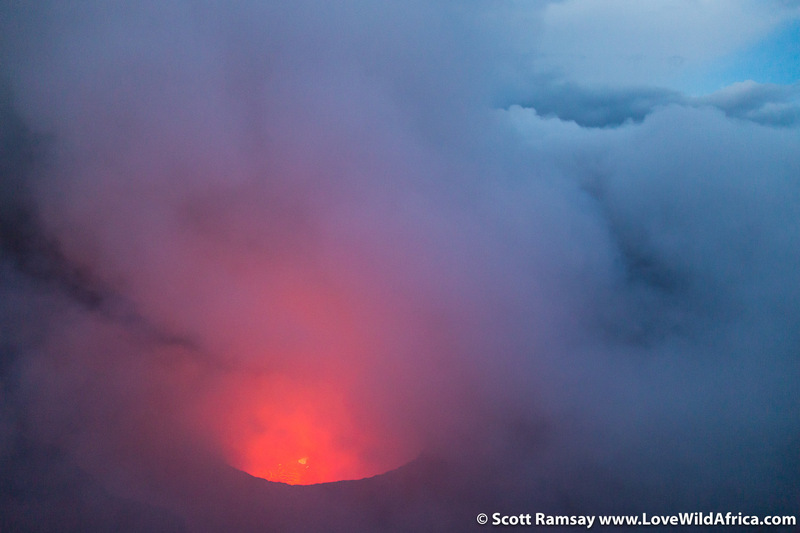 The colours were spectacular just after sunset…when the gas and clouds turned blue and the lava lake glowed. This is what Nyiragongo is all about. Mesmerising. The lava flows from the edge of the lake, towards the centre, where it flames up, spouting magma twenty metres high into the air. It’s hard to think of a more hostile place on Earth, besides the coldest oceans. Up close to the lava. This photo taken with a 500mm lens, and cropped in to reveal the detail. It’s like watching the beginning of the creation of the Earth…on one hand, you know you’re privileged to see such a sight, but on the other hand, you do feel quite a bit out of your depth. These are primal, godly, universal-sized forces at work…and it’s no place for Homo sapiens, really. 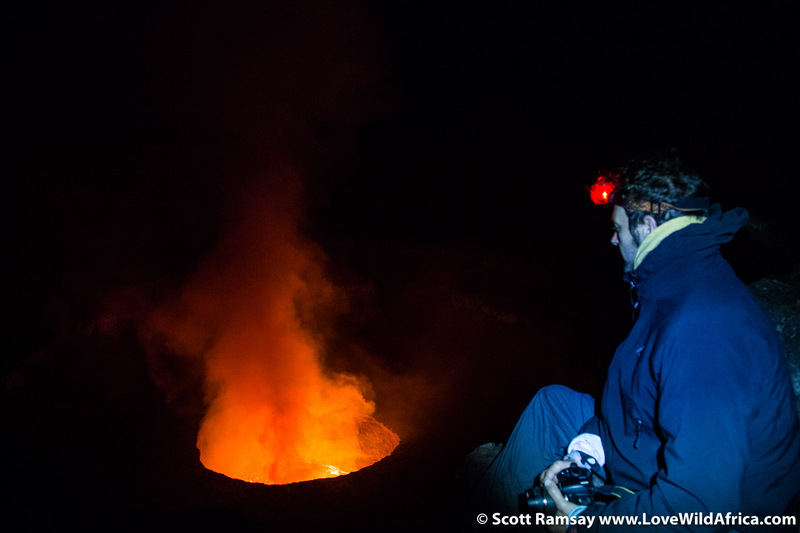 Gael and I stayed up late into the night, to check out the lava lake. We also ate some chocolate. I think it would make a great Cadbury’s advertisement. We couldn’t feel the heat from the lava lake below us, but apparently when there is no wind, it’s possible to warm your hands on the hot air rising over the crater rim. Early morning on top of Nyiragongo. The wind had dropped, and the sky had cleared of clouds. Gael and I got up early in the morning to have one last look at the crater…and interestingly, my photos from the morning were clearer, because of less gass and cloud in the air. Perhaps it had something to do with the drop in wind or the cooler temperatures. Gael seemed more mesmerised than me with the lava lake. I put that down to his fiery Celtic roots. Clouds in the valley below, early morning. This view is looking across into Rwanda. This region of Africa is achingly photogenic and seems so peaceful at first glance. Then you have to remind yourself that it’s been at the centre of one of the biggest losses of human life in the past century. The sun rises, and a new day begins. 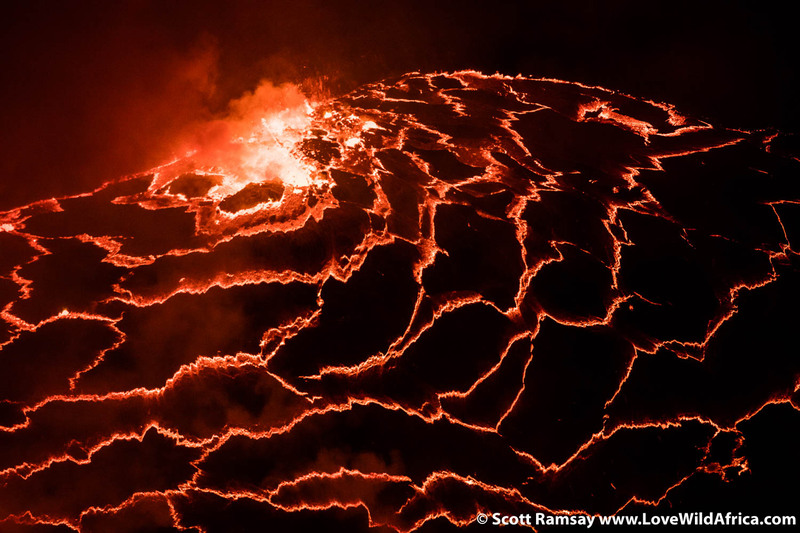 For 5 billion years, the Earth’s been moving and shaking its foundations…Nyiragongo is living evidence of that. 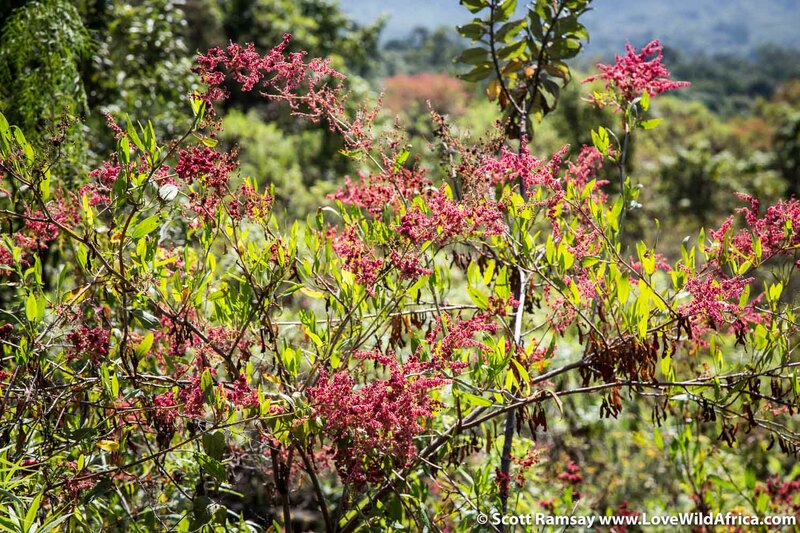 Even though Nyiragongo erupted through a fissure in its southern flanks in 2002, life has bounced back spectacularly. It’s kind of reassuring! Thanks Sue, yes, a surreal experience. 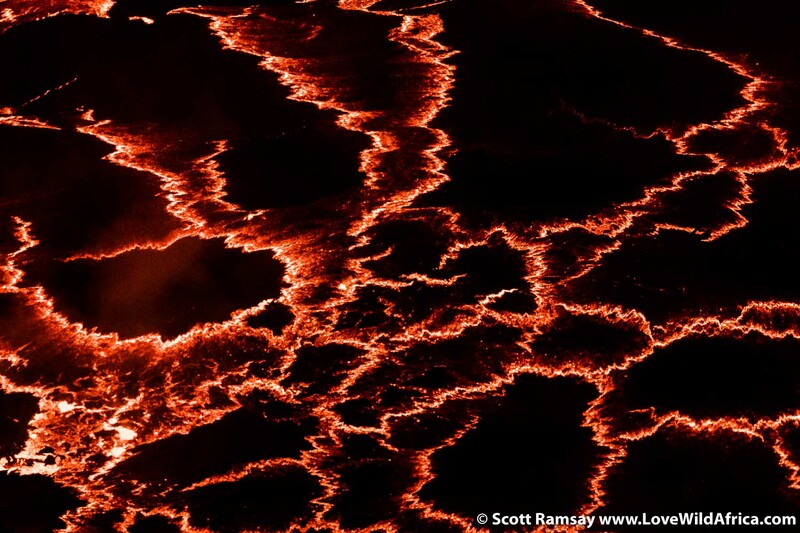 And very few places where to see a lava lake like that.